The Paint Station sparks creativity by allowing children to paint outdoors on a transparent polycarbonate paint surface. The polycarbonate paint surface is unbreakable and paint washes off easily. The paint shelf features seven cup holders on each side that fit standard reusable cups for holding paint. Available in colors as shown only. ADA Accessible. 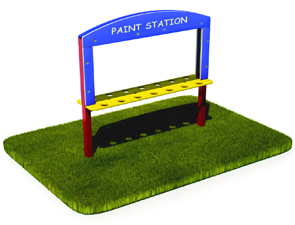 The outdoor paint station mounts into the ground. Manufactured and tested in accordance with ASTM standards.